The Simpsons has been my absolute favorite television show for essentially my entire life, despite the decline in quality over the years. Sure, the show hasn't been good in over a decade, but that doesn't mean the first dozen or so seasons aren't still fantastic! Since I've grown up with the show, I've learned quite a bit from it about some of the most random things imaginable, ranging from pop culture references to things like how to greet someone in Japanese. It's kind of astonishing how much more I've learned from this animated sitcom in comparison to what I learned in college, and how much it's shaped aspects of my life. I've made friends while bonding over the show, and some of what happens in the series has found its way into my own character. Inspired by a post on Facebook that brought up the topic, I thought I would present to you a list of just some of the quotes that I've picked up from The Simpsons and adopted into my everyday life and speech patterns. Enjoy! While other characters are talking things out, Bart chimes in out of the blue after not having spoken for quite some time. When everyone looks at him in surprise, he simply expresses this. You'd have to imagine that the writers just realized that Bart literally hadn't said anything in a while, so they tossed this line in there to poke fun at it. Frequently, if I realize that I've been silent for a good chunk of time while other people are talking (outside of when I'm just supposed to be listening, of course), I'll typically say something random and follow it up with this line. Simply put, Homer doesn't understand what's so funny about a joke (told by one of my favorite comedians of all time, Steven Wright—seriously, go check out his stuff, it's hilarious) and reaches a point where he basically just gives up and laughs. This has become my go-to response when I'm in this situation and I feel as though I'm particularly stupid for not getting a joke. This was such a random thing to put in this episode—especially for Bart and Lisa to be the ones in the conversation—and it always struck me as a funny non sequitur to pull out of nowhere, just to fill time when you're shooting the breeze with someone and running out of small talk. This word first appeared in a different episode ("Sideshow Bob Roberts"), but it solidified itself with Lisa's emphatic use. Like "yoink," this is so ingrained in my lexicon that it often doesn't register to me as something I picked up from the show. "Meh" is a fundamentally perfect word that gives off exactly the vibe it's supposed to and also is constructed in a way that even when you say it, you're almost forced to say it with a half-assed attitude. How great is that? Supposedly this originated from The Flintstones, but The Simpsons have given the sound-effect-turned-word a whole new life. I originally didn't have this on my list because saying it when grabbing something is so natural to me now that I'd forgotten I picked it up from the show; it just feels like something everyone who knows English should say. The Simpsons Archive has a list of some yoinks from over the years. Showing off his old-timey ways, Mr. Burns answers the phone like this, which was the original greeting Alexander Graham Bell had planned to use for the telephone. You'd be surprised how many people have no idea what the hell you're saying if you answer the phone in this fashion. In the episode, Bart is being incredibly annoying to Lisa because she's entrusted to be his babysitter, so he tries to make the experience a living hell. When she tells him to go to bed, she finds him sitting down at the kitchen table, just eating bread. The word games ensue, where he suggests that she told him to "go to bread" rather than bed. Although I don't find myself in situations where I need to pull this to annoy someone, I will sometimes refer to going to sleep as "going to bread" in the hope that some fellow fan will catch the reference and chuckle. After Homer gets a job as a food critic, there's a plot to kill him at a local food festival. When that plot is foiled, our standard trio of cops (Chief Wiggum, Eddie, and Lou) discuss what to get to eat, and Lou says he's in the mood for frittatas. 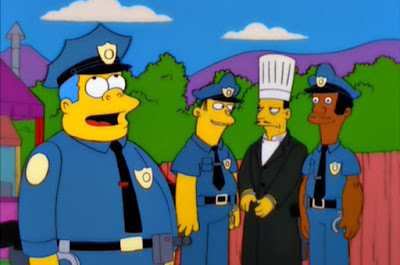 Wiggum and Eddie crack up laughing long enough for the pastry chef to escape custody, and Wiggum puts a stamp on his laughter with a simple "Ooooh, he likes eggs." I love the idea of laughing hysterically at a joke, and when you've finally calmed down, reiterating what was so funny about it that made you laugh in the first place. Skinner is such an uptight character that it's great to see him genuinely enjoying himself in this episode, laughing at how problematic things have gotten for Ned Flanders, who takes over his job as principal. Skinner laughs so much that he says this when he has to calm down. Over the years, uproarious belly laughter will get this punctuation from me, often after I've reiterated why I'm laughing from the entry above. While everyone was booing at Mr. Burns, Smithers tries to cover it up by saying that they're not booing, they're actually saying "Boo-urns" instead. Burns asks the crowd to clarify this, and of course, they deny it—except for Hans Moleman, who pathetically declares that he was indeed saying "Boo-urns" the whole time. Naturally, if there's a crowd booing, this pops into my mind. Can the monorail outrun The Flash? You betcha. Can Superman outrun The Flash? Eh, sure, why not? This would be in the top three of the most used ones on this list for me. It's become the go-to phrasing and cadence for whenever I'm not sure what an answer is, and I really don't care all that much. Side note: this is one of my absolute favorite episodes, and it's a shame I don't get a chance to argue that Batman's a scientist or say that I shouldn't have stopped for that haircut, too. This one has actually even spawned a non-Simpsons variation out of its frequency of use. Back in my high school days, a couple of friends of mine were also big fans of the show, and it became natural for us to use this, so one of my buddies actually followed it up with "It's funny, cause I'm laughing." That really doesn't make all that much sense, but it took the comedy of this phrase to the next level for me anyway. Many situations are legitimately funny because they're true, but it's so much better to use this when something's clearly a joke to turn it into a secondary joke that is a bit meaner. Fortunately, I've never had the mafia point a gun at my head and bash my hands up, but if I'm feeling awkward, especially if I can tell that someone else wants me to leave a scenario, instead of just saying I'm going to leave, I'll toss this quote out there to point out to everyone else how awkward I feel. Obviously, I don't frequently find myself able to use this whole phrase, but similar to the post-laughter sayings above, if I think I brushed over something really big and ended my sentence abruptly, there's naturally going to be a bit of a pause. If that pause is pretty long and awkward, I'll follow it up with a cough to retroactively take responsibility for how uncomfortable the silence was. Is there a better way to express how everything is going well in your life than this quote? I'm pretty sure the first thing I said when I got glasses was this line, followed up with "I'm kidding, I'll take them." I have a particularly horrible sleep schedule—like, horrible, horrible. There's entire weeks where I may only sleep a couple of hours. On top of this, I spend the majority of my time in the house working on stuff, and I'm not much of an outdoorsy guy, but even when I am outside, I prefer moonlight over sunlight, so if it's too damn bright outside, I can be heard genuinely saying this. "Hey Lenny, sending some outgoing mail?" "I'll probably send some tomorrow." I love the lack of enthusiasm behind how mundane this is. It's the type of conversation you have on a regular basis but immediately forget because of how utterly pointless to your day it is. If I feel like I'm with someone and we need some small talk, I'll take inspiration from this, point out something that they're doing, let them know that I'll probably do the same thing soon, and then I'll leave. Smarch is the worst month, isn't it? If it's around March and anything is going on with the weather, rest assured I'll be saying this quite often. Hell, even if it isn't around March, it can still be referenced. Those aren't even words, but I think they're perfectly cromulent and can embiggen any sentence. This is SUCH a good joke. Why is Bart the only one laughing? I think it's perhaps the wittiest thing Homer's character has ever said and legitimately just a hilarious zinger. Even though this doesn't tie itself to '90s culture in the episode, I tend to pull "to the max" out when referring to something that's totally radical from that era. I'm pretty outspoken, so once in a while, I'll say something that will get under someone else's skin because they consider me horribly insensitive. I'm totally not a horrible monster, but if I were to say something such as I'm not a vegetarian because bacon tastes too good, and someone asked how I could eat an animal, I'd likely respond with either something snarky like "on a lightly toasted bun" or a general statement of passive acceptance like "gotta ____ something," such as "gotta eat something." This comes from one of my favorite episodes, wherein Lisa pushes Homer's pig off the grill, and it goes through the bushes, into the road, through a dam's spillway, and then is rocketed into the sky. I don't eat things that I drop on the ground, but if I'm in a lighthearted enough mood, I'll tend to throw this phrase out there if only to make myself laugh at the situation. Bonus points for another one of my favorite jokes with Wiggum laughing at the pig's nose. I'll admit, I use lowbrow expressions from time to time. Thus why this list is so long! I'm sure there are dozens, if not hundreds more that I don't currently remember and some that I may not even realize I've picked up from The Simpsons, but this is just a taste of how influential a TV show can be on your life—or at least on mine. 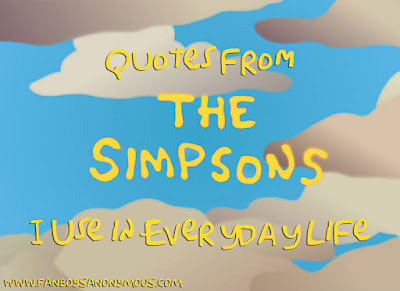 What are some of your favorite quotes from The Simpsons that you've adopted into your regular speech patterns? Do you instinctively say "D'oh!" when you're angry or position your hands like Mr. Burns when you say something is "excellent"? Are you guilty of saying "zork" and referring to bananas as yellow fatty-beans? Enlighten us on all the craptacular things you say by leaving a comment below, especially if you pronounce it "avoision," you Kwyjibos!